Multiply the samples by sine waves and cosine waves and add them, then the magnitude of these (complex) numbers will show how much energy is present for the frequency of the input signal. The target here is to detect a single frequency in a sampled waveform x(k) using simple algorithms without lookup tables or ram storage. In order to simplify computation it is desirable that the sampled waveform fits into one byte. This can be achieved by sampling the incoming signal at 8 times the target frequency. In addition, a one bit A/D converter is used for sampling, basically one input of the microcontroller is a comparator. These two steps make further computation easier and of course faster. The one bit A/D conversion allows to use microcontrollers which have no built in A/D converter, like the ATiny2313. In order to detect a target waveform contained in the incoming signal, multiply the two and add the resulting product. The single number that results from this procedure is a measure of how similar the two signals are. Each sample in the frequency domain is found by multiplying the time domain signal by the sine or cosine wave being looked for, and adding the resulting points. It means correlating the input signal with each basis function. Now with a 1 bit A/D converter and each time domain signal in 1 byte the sin term is also 1 byte: sin term = 11110000 and the cos term 00111100, which is fixed at the given frequency. For multiplication an exclusive OR operation (eor) is used. and the same for the sin term. After sampling e.g. 64 samples add the sin and cos term and that gives the signal strength. N_samples are the number of samples, e.g. 64.
which is currently not implemented, seems enough to use the Q0 term. To test the above algorithms a ATiny2313 clocked by a 10 MHz quartz was programmed in assembly language. Our frequency of interest is 1 kHz so the sampling frequency is set to 8 kHz and 64 samples are taken, 8 ms for the whole process. At the start we synchronize sampling with f1_in: wait for a low on the input pin then a high, then start sampling. After 64 samples the data are converted to decimal values and send through serial interface to a PC for recording. We see that the Goertzel Q0 has a maximum at 1 kHz, falling sharply at the lower frequency side and sloping gently at higher frequencies. Q0 and Q1 are the same, Sq is sqrt(Q0^2 + Q2^2) plotted to see if it might be useful but it seems enough to use Q0 and a threshold to detect the incoming frequency. The detection range can be broad or narrow, depending on the threshold. At 1 kHz the sine term of the correlation has low values as expected when using an exclusive OR operation (eor) for multiplication, the absolute minimum is at 1020 Hz. Same as before the sine is falling sharply at the lower frequency side and sloping gently at higher frequencies. The sum of sine and cos term gives a detection range of 60 Hz centered around 1 kHz. It is probably enough to use the sine term and a threshold to determine the filter bandwidth. 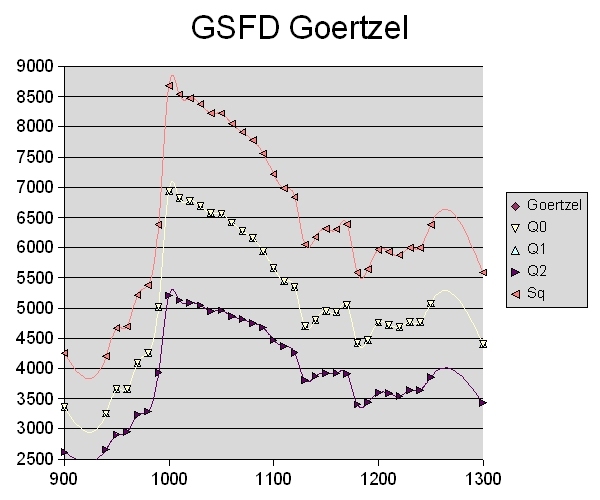 Both are not much affected by odd harmonics but the GSFD Goertzel algorithm has another maximum at 2 kHz ,6664, lower than the one at 1 kHz, 6944, but still visible and quite close. 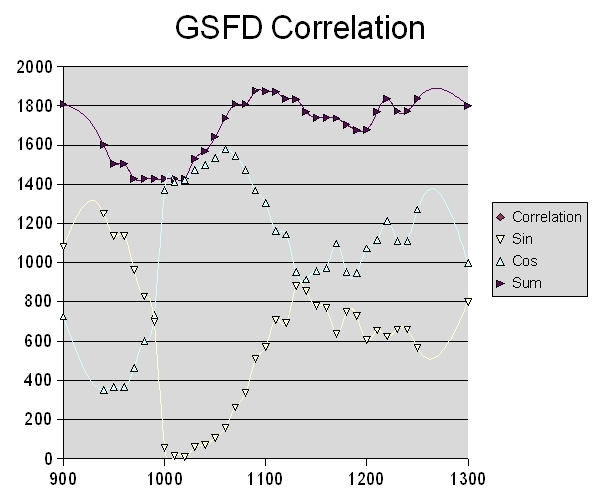 The GSFD correlation algorithm also reacts, the sum term goes from 1428 to 1680 but this is about 15 % higher and it seems more resistant to harmonics. If the input is open and 50 Hz get in the microcontroller the Goertzel is at 7000 and fires whereas the correlation does not. Both algorithms can run on a basic microcontroller and will detect the frequency of interest quite well. The correlation algorithm however is easier to program and sensitive and the result will be as good as the threshold setting. Here sampling is synchronized with the incoming waveform, we wait for a low on the input pin then a high and then start sampling. It would be interesting to see what happens if this is not done and the phase is more or less random. The incoming waveform was a clean sine signal, so it remains to be tested in real world noisy signals. In a more practical application it can be used for DTMF decoding which has not been tested yet. After sampling 64 samples the sampling frequency is changed, 8 times for the 8 DTMF frequencies, e.g. 1209 Hz would be sampled with 9672 Hz. The process takes about 64 ms to complete. Anyway, a LM567 is the easiest way to detect a single frequency but this is more fun. *1) :The Scientist and Engineer's Guide to Digital Signal Processing By Steven W. Smith, Ph.D.
ldi	temp0,'?' ;something else ?? ?